I have more Lacquerhead Polish to share with everyone and it's the perfect time to buy them because Alischia, the creator of Lacquerhead Polish, is offering free shipping on all orders until Monday! The code is posted on my deals page here and at the bottom of this post. If you didn't already know, I'm in love with her jelly polishes and I picked up all 4 of them in full size with the deal. I think it was only a few hours (maybe not even that long) before I received a tracking number on them; you can't beat great priced polish and great customer service! 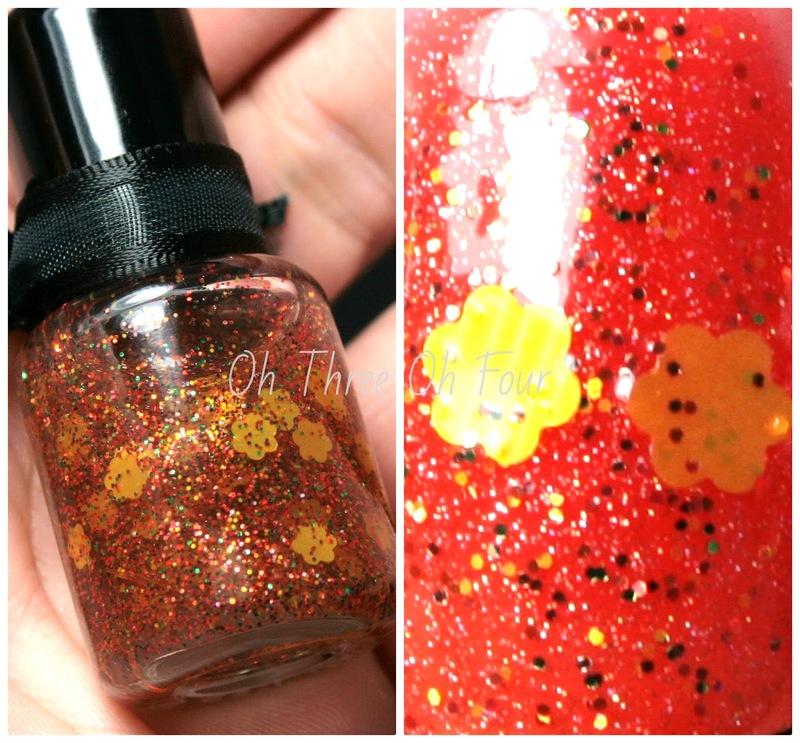 Lacquerhead Polish Mums The Word has a clear base with brown, copper, green and orange glitters and yellow "mums". All nails are 2 coats of Mums The Word over 3 coats of Lacquerhead Polish Orange You Jelly (post here) and a top coat of Seche Vite. First off, tell me you didn't laugh at least a little bit when you read the name! :P Rainbow Farts is a clear based polihs with small rainbow hexes and small white squares. With the exception of my ring nail, I used 1 coat of Rainbow Farts over 3 coats of Lacquerhead Polish Cherry Bomb (post here). My ring nail is 2 coats and all nails have a top coat of Seche Vite. No "fishing" needed to get a lot of glitter with just one coat, it dried quickly and was generally just amazing like all of Lacquerhead's polishes! ;) Rainbow Farts not only has a fun name, it's a fun color! I definitely livens up any polish and I can only guess would look great over all of Lacquerhead Polish's jelly colors (I know I can't stop talking about these! :P ). 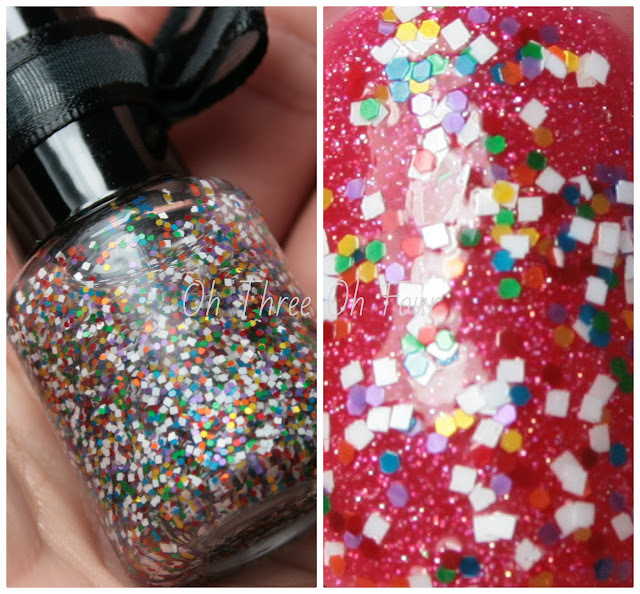 You can also use Lacquerhead Polish's jelly colors to make a fun "jelly sandwich" with this glitter! I added 1 coat of Cherry Bomb over the above mentioned combo. 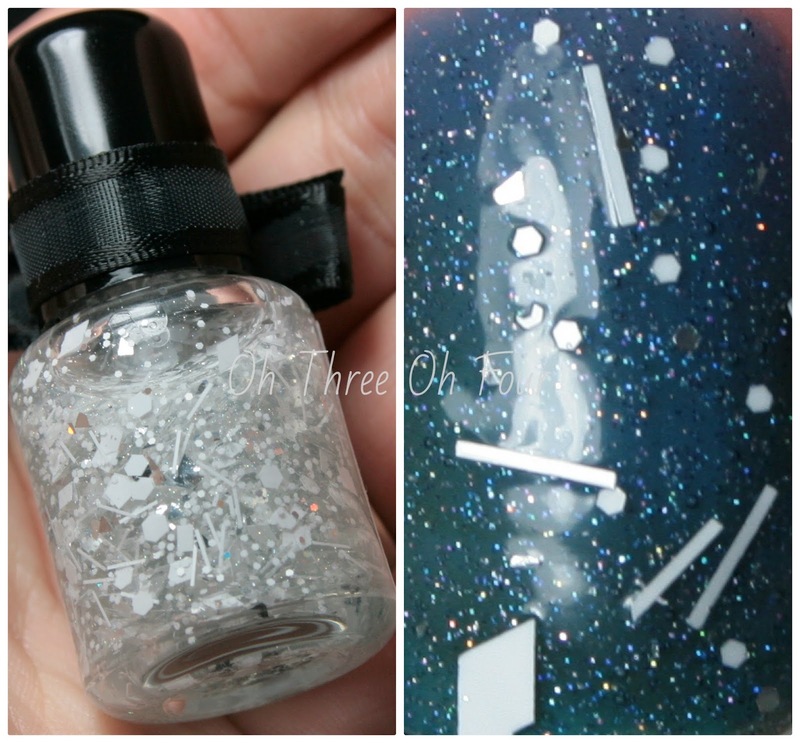 Snowflake is a clear based polish with white and silver glitter and silver shreds. All nails are 1 coat of Snowflake over 4 coats of Lacquerhead Polish Blueberry Yum- Yum (post here) with no top coat. I think the silver shreds in this polish make it something very unique! They all sat perfectly flat on my nail without a top coat, so I opted not to use one. I did have a problem with the bar glitter sticking up on my pinky, but that was only because it went to the curve of my nail and not at all the polishes fault. Of course the formula was great! ;) I got that nice, medium sized silver shard on my ring finger with no "fishing" and I was really happy about that. :) I love all the unique combinations Lacquerhead creates and this is one of them! Find Lacquerhead Polish on etsy here. Currently she is offering free shipping with the code ILOVEFREESHIPPING it expires on 11/26 at midnight CST. Also, I just received one of her cuticle oils in the mail scented like Victoria Secret's Love Spell and not only does it smell exactly like Love Spell, it works great and is super easy to use! Make sure to like Lacquerhead Polish on Facebook here!